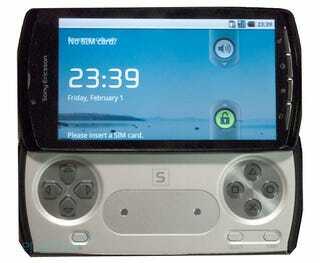 Still unofficial, the PlayStation Phone will be released next spring, reports Japanese newspaper the Asahi Shimbun. According to the report, the Sony Ericsson-developed phone could go on sale first in the U.S. and Europe and be based on the PSPgo and use slide-out PSPgo-style gaming controls. However, instead of analog thumb nubs, there is apparently a touch-sensitive tracking pad. UMD and Memory Sticks seem to be eliminated, too. Sony Computer Entertainment did not offer a comment to Bloomberg regarding this story. As previously noted, the PlayStation Phone is rumored to be based on Google's Android 3.0 platform and sport a "custom Sony Marketplace which will allow you to purchase and download games designed for the new platform." The Sony Ericsson phone is also reported to pack in 1GHz Qualcomm CPU, 512MB of RAM, 1GB of ROM, and a screen "in the range of 3.7 to 4.1 inches." And if it's real, it could be out in the West as early as next Spring.